After demonstrating how to made a side step card in my class the other day, I came home with a Perfect Plum side step card to finish and decided to make it masculine. The car is sitting on a watercolour background that was very simple to do. I started with a piece of shimmery white cardstock cut to size. Then, with a large , wet brush, I picked up some Tip Top Taupe Ink and painted it, horizontally, across the cardstock. While it was still very wet, I picked up some Soft Suede and ran it across the card fairly randomly and then I added some Early Espresso where I guessed the car shadow might be. I sprinkled the still wet watercolour with some small pieces of rock salt and left it to dry. The rock salt draws out moisture and some of the pigment with it. When dry, I brushed off the salt and was left with some little marks where the salt had been sitting. I was hoping to achieve a pebbly or unsmooth looking surface and I'm not unhappy with the result. 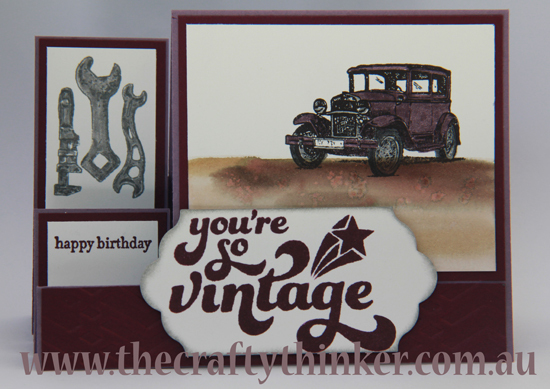 I stamped the car image from Guy Greetings with Archival Black Ink and coloured it with Many Marvellous Markers in Perfect Plum, Smoky Slate and Basic Gray. With Blackberry Bliss ink, I stamped a greeting from That Thing You Did and cut it out with a Lots of Labels die, adjusting the length of the label using this method. I sponged the edge with Smoky Slate ink and placed it onto the card with dimensionals. 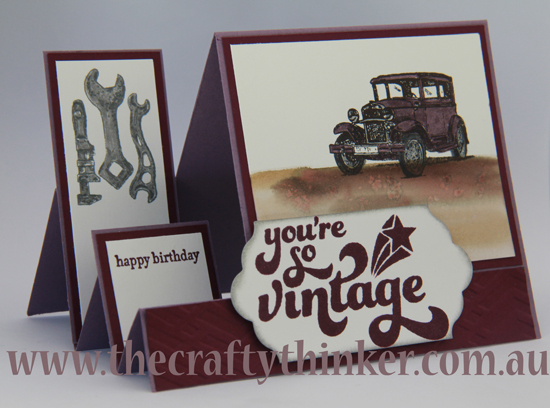 The Happy Birthday greeting is from Teeny Tiny Sentiments and I stamped it with Blackberry Bliss ink. I stamped the tools from Guy Greetings with Basic Gray ink and coloured them with a Smoky Slate marker - adding an extra layer of ink to the edges for some depth. I added layers of Blackberry Bliss cardstock, embossing the very front strip with the Zig Zag embossing folder. 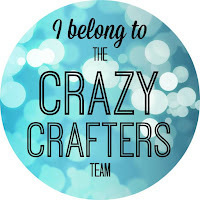 If you would like the supplies to make this project, click on the product image below. Thank you for your kind comment! I'm so sorry that I didn't spot it before now!